So, the parade of reminiscences about concerts and such stops abruptly at the end of 1985, because at the beginning of 1986, I left Austin. I gave you the hints in the last entry - I hated my job, I hated my roommate. I loved my friends but I was 25 and I felt like my life needed to go on and I didn't feel like that was going to happen in Austin, mostly because there was so much competition for every decent job in Austin. And I had a teaching certificate that I hadn't done anything with, and a library degree I hadn't really done anything with either. To be a school librarian, you have to have teaching experience, so I decided I should get some. So I moved home "temporarily" with my parents. The idea was that I would get a job and be gone again. Unfortunately I waited rather late to apply for the jobs for the semester, and the jobs were pretty limited at that point. (I was and am way too impulsive about these things. I think it would have been more logical to wait - to stay in Austin a few more months, maybe, and start looking for jobs in the summer. But I didn't do that, obviously.) I came really close to getting a job in my hometown, but I didn't get it. So I spent the spring substituting - mostly in elementary school. Mostly I enjoyed it. But then school was out and I got a summer job - in Galveston, at Gaido's, which is a fancy seafood restaurant. Yeah, we had a mix-tape. (See below for a bit more about that.) 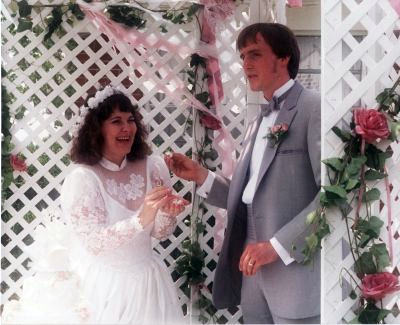 We got married at my parents' house, which was not the house where I grew up, but out in the country, and we had the wedding in the back yard, on a tiny budget. I loved how it turned out. And well, it hasn't been a bed of roses, but that'll be 28 years ago this spring, and we're still married. So I guess it all turned out pretty well, right?